قائدرحمتی, رضا, مرادزاده, علی, فتحیان‌‌پور, نادر, کن لی, سونگ. (1394). بهبود وارون‌سازی دوبُعدی داده‌های مگنتوتلوریک با استفاده از روش‌های خودکار انتخاب پارامتر منظم‌سازی. مجله ژئوفیزیک ایران, 9(1), -. رضا قائدرحمتی; علی مرادزاده; نادر فتحیان‌‌پور; سونگ کن لی. "بهبود وارون‌سازی دوبُعدی داده‌های مگنتوتلوریک با استفاده از روش‌های خودکار انتخاب پارامتر منظم‌سازی". مجله ژئوفیزیک ایران, 9, 1, 1394, -. قائدرحمتی, رضا, مرادزاده, علی, فتحیان‌‌پور, نادر, کن لی, سونگ. (1394). 'بهبود وارون‌سازی دوبُعدی داده‌های مگنتوتلوریک با استفاده از روش‌های خودکار انتخاب پارامتر منظم‌سازی', مجله ژئوفیزیک ایران, 9(1), pp. -. قائدرحمتی, رضا, مرادزاده, علی, فتحیان‌‌پور, نادر, کن لی, سونگ. بهبود وارون‌سازی دوبُعدی داده‌های مگنتوتلوریک با استفاده از روش‌های خودکار انتخاب پارامتر منظم‌سازی. 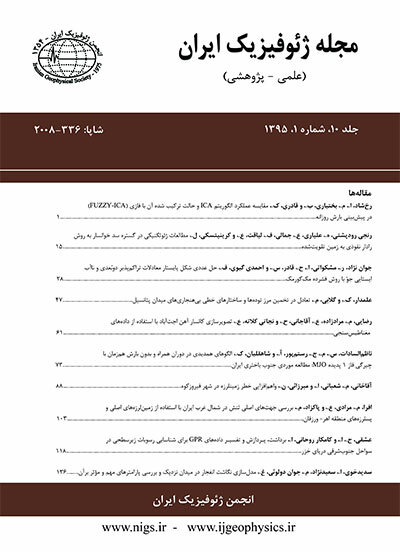 مجله ژئوفیزیک ایران, 1394; 9(1): -. تولید یک مدل مناسب در حل منظم مسئله وارون به انتخاب مناسب پارامتر منظم‌سازی وابسته است، لذا برآورد این پارامتر می­تواند اهمیت زیادی داشته باشد. در اکثر مسائل وارون، این پارامتر به‌صورت تجربی انتخاب می­شود. هدف از تحقیق حاضر، عرضه و به­کارگیری روشی برای انتخاب خودکار پارامتر منظم‌سازی مناسب برای وارون‌سازی دوبُعدی داده­های مگنتوتلوریک است. برای این منظور دو روش اعتبار­سنجی تقاطعی تعمیم­یافته (GCV: Generalized Cross Validation) بهبود­ داده شده و منحنی LL-Curve) در الگوریتم وارون‌سازی دوبُعدی داده‌‌های مگنتوتلوریک به کار برده می­شود. برآورد پارامتر منظم‌سازی با این روش­ها در یک مثال مصنوعی تقریباً پیچیده و با اِعمال دو درصد نوفه تصادفی و همچنین برای یک دسته داده واقعی تشریح می­شود. نتایج حاصل نشان می­دهد که هر دو روش فوق در انتخاب پارامتر منظم‌سازی در داده­های مصنوعی توانمند هستند. همچنین نتایج به‌دست آمده برای داده‌‌های واقعی و مقایسه آنها با نتایج به‌دست آمده به روش ACBActive Constrain Balancing) نشان می­دهد که روش GCVبهبودیافته به‌‌خوبی قادر است پارامتر منظم‌سازی را برای تولید یک مدل مناسب برآورد کند، در صورتی‌‌که روش منحنی Lبه همراه یک طرح کنترلی می­تواند مفید واقع شود. Â Â Â Undoubtedly, the most common and well-known form of regularization is the one known as Tikhonov regularization (Tikhonov and Arsenin, 1977). In Tikhonov regularization, the regularization parameter (l) is a parameter that acts to trade off between minimizing the norm of data misfit and the norm of the model. A good regularization parameter should yield a fair balance between the misfit and the model norm in the regularized solution. Â Â Â One of the main problems in the solution of inverse problem in terms of Tikhonov regularization is that the regularization parameter is unknown. The inversion algorithms for selection of regularization parameter can be roughly divided into two groups. In one group, the regularization parameter is estimated by a fixed value and the problem is solved by the fixed regularization parameter during the inversion process. In another group, the regularization parameter is estimated at each iteration of inversion. The first method which uses a fixed regularization parameter, i.e. the minimization of Tikhonov regularization (or functional of inverse problem) is done a few times. Each minimization is solved with an experimental regularization parameter and a solution is obtained. If the solution is judged to be satisfactory by some criteria, then the inverse problem is considered to have been solved. In the second inversion group, it is however preferred that the regularization parameter is estimated at each iteration of the inversion. Most of the methods in the second group use the discrepancy principle criterion to choose the regularization parameter. The discrepancy principle method is based on the noise level of the data. Unfortunately for most of the field data the noise is not known. Â Â Â In this study, it was attempted to use the modified generalized cross validation (GCV) and L-curve criteria as two automatic selection approaches for regularization parameter in two-dimensional (2-D) magnetotelluric (MT) data inversion. GCV is based on the philosophy that if an arbitrary element of the observations is left out, then the corresponding regularized solution should predict this observation well, and the choice of regularization parameter should be independent of an orthogonal transformation of the observation vector. This leads to choosing the regularization parameter which minimizes the well-known GCV function. Â Â Â If solutions of the inverse problem are computed for all values of the regularization parameter, the graph, using logâlog axes, of the misfit versus the model norm tends to have a characteristic âLâ shapecalled L-curve. The optimal regularization parameter corresponds to a point on the curve near the âcornerâ of the L-shaped region. There are several algorithms to find the corner of the L-curve; here the robust adaptive pruning algorithm was used for this purpose. Â Â Â The above methods were included in a 2-D magnetotelluric data inversion codes provided by the fourth author (Lee, et al., 2009). The performance of each of the two regularization parameter selection methods is then investigated by the 2-D inversion of synthetic and real MT data sets. The resulting 2-D inverse models produced by the inversion of the synthetic data set using the modified GCV and the L-curve approaches were generally in good agreement with the model from which the data were generated. However, the constructed model from this synthetic data using the modified GCV was slightly better than the model obtained from L-curve method compared to the original synthetic model. This reflected that the values of regularization parameter obtained from the modified GCV routine were more suitable than those obtained from the L-curve method. This is clear in a distinct minimum of the GCV function and slightly indistinct minimum value in the L-curve of each iteration in the 2-D inversion. Â Â Â The obtained 2-D geoelectrical models from real MT data set using the modified GCV and L-curve methods have been compared with the model obtained by the inversion of the same MT data set using the active constrain balancing (ACB) method. In a 2-D inversion using the ACB method, the various set of values, minimum and maximum, of regularization parameter were tested for several performances of inversion of the real data to obtain the suitable model with respect to misfit and model norm. The inverse model obtained using the GCV method for the real MT data was well comparable with that obtained using the ACB method. The closeness of the corresponding values of regularization parameter for the modified GCV and ACB methods in this example could also indicate the robustness of modified GCV approach for the inversion of MT data. Although the results for the L-curve were not as well as those obtained using the modified GCV, the obtained results indicated that application of this method combined with an imposed cooling-schedule-type behavior could be efficient for inversion of MT data. Â Â Â The computation time was not an issue in this study, but it is important and should be considered. For example, on an Intel Core i5 CPU (2.53 GHz),4 GB RAM computer, the inversions using the modified GCV and the L-curve methods for the real data took 267.4 and 210 sec., respectively, while this computation time for one performance of the inversion using ACB method was 209.8 sec.